Does Your Turtle Say, "Ribbit?" Like me, you probably don't spend your days contemplating turtles – but turtles may provide you with an unanticipated shot of creativity. It's not that I have anything against turtles, they are marvelous animals after all. They carry their home with them wherever they go which is convenient if you've had too much to drink, don't feel like driving all night, or just want to pick up and move out of state. They figure prominently as teenage mutant ninjas. Heck, even a relative of the turtle (a tortoise mind you) bested that cocky hare in a foot race. But then I started thinking about turtles a lot, and for that I have my daughter to thank. She's 20 months old, and a few months ago she declared that turtles say, "Ribbit." She was positively reinforced by the laughter and smiles she got in response - who can resist a toddler saying, "Ribbit?" It could be that she met the world's first bilingual turtle - if so that turtle has a bright future helping frogs and turtles communicate. And then one day I drew a turtle for her. She asked for another and another and another. "Daddy, draw a blue turtle." "Daddy, draw a red turtle." Daddy, draw a orn-jinge [sic] turtle?" I draw. She colors. Soon our paper is populated with crudely drawn turtles of different colors. I then tried giraffes, whales, sharks and owls, but she always came back to turtles. Lots of turtles. Her stuffed one-eyed (it wasn't glued on very well) pink turtle inspired the song "I'm a turtle swimming in the water/I'm a pink turtle bloop, bloop, bloop!" 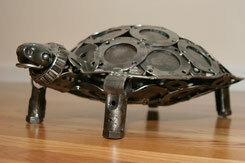 Turtles had become so much a part of our life, that my wife commissioned my friend Joe to weld/sculpt a turtle out of found metal parts. That's his creation in the photo. As a side note, his work is truly amazing. When he and I talked about the process, Joe mentioned that creating turtle was a challenge – this from a guy who welded an enormous giraffe. He had to think about his process differently. My daughter was so amazed when she saw the turtle that she wanted to pick it up, but couldn’t lift it. She settled for sitting on it and patting it. So, while my daughter insisted that turtles say, “Ribbit,” she sparked a small wave of creativity, gave us some time together to create art, and brought into our life a wonderful welded sculpture. Lesson? Accept what you think might be wrong, and see where it leads you. So, does your turtle say, "Ribbit?"